The concept of ‘Trademark’ is not new in the Indian scenario. In this 21st century of commercial, technical and scientific advancement, the importance of ‘trademark’ to a business house or the manufacturer of goods to which such marks are applied cannot be undermined. The increasing number of litigations in the trademarks arena does prove the fact of its increasing importance. ‘Trademark’ as the name itself suggests, is a ‘mark’ is inclusive of a visual symbol, a word, collection of words, combination of colours, and any form of graphical representation which is used to distinguish the goods of a particular manufacturer from similar goods manufactured or dealt with by other persons. To be precise, Trademarks trace the ownership of the goods in respect which they are used, and also represents the goods as being of a particular quality. Thus the ‘mark’ creates an ‘image’ or rather advertises the product for which it is used. It will not be an understatement to say that today almost all the big brands in any industry are recognized by their trademark. Eg: The unique style in which the letter ‘A’ is wrtiten in ‘Amul’ or the ‘Parle-G girl’ for Parle-G biscuits. 1. 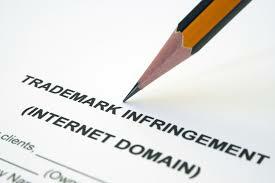 The concept relating to infringement of marks is contained in section 29 of the Trademarks Act 1999. In layman’s language, infringement involves violation of the exclusive rights attaching to a registered trademark, without authorization either of the proprietor, or his permitted users and assignees. 2. It involves the unauthorized use of marks deceptively similar or identical with the mark of the proprietor, in such a way that such use causes confusion among the public. This is so because a registered mark acquires an image in the minds of the public such that they start recognizing the goods of the proprietor on the basis of the said mark, and in such a scenario, the use of a similar mark tends to create a dilemma among the regular user of those goods. 3. To establish infringement with respect to registered trademarks, it is only necessary to establish that the infringing marks are identical or deceptively similar to the registered marks and no further proof is required. 5. Another important principle in the cases of infringement is that the likelihood of confusion must be considered from the standpoint of general, rational consumer, who is neither too careful, nor too careless, and having imperfect memory thereby unable to precisely distinguish between deceptively similar goods. 1. ‘Passing off’ is a form of common law tort, used to enforce unregistered trademarks. This law prevents a person from ‘passing off’ or misrepresenting the goods or services of another as his own. The provisions relating to passing off are contained in S(27) of the Trademarks Act, 1999. 3. The nature of property protected in passing off cases is the ‘goodwill’, which attaches itself to the plaintiff’s business, with the name, or mark being the vehicle for the goodwill. Thus, an author, playwright or film script writer can claim goodwill in a fictional character, and a film producer having license to use the story creating the character, can build up a goodwill which can be protected in a passing off action, even though he may not be the owner of the copyright. – Shaw Bros. v/s Golden Harvest. 5. Unlike in an action for infringement, merely proving similarity or identity of marks is not sufficient in passing off. It must be proved that the use of the mark is likely to deceive or cause confusion. Infringement and passing off in the Indian pharmaceutical industry. To understand the aftermath of infringement and passing off, the concepts have to be analyzed from 2 standpoints. Firstly, from the viewpoint of the registered proprietor of the marks, and secondly and most importantly, from the viewpoint of the consumers. Perspective of the registered proprietor. – Loss of ‘Exclusive control’ over the goods or services. – Loss of ‘Goodwill’ of the proprietor business. In addition to the above mentioned losses, another important loss which accrues to the proprietor, is the loss of all the time, money and efforts invested by him, over a period of time, in striving to build an ‘Image’ for himself and his products and services in the industry. – Confusion as to the ‘reliability’ of the goods or services purchased or availed of. – Serious effects on health and safety of the consumers. – Loss of value for money. Infringement & Passing off in the Indian Pharmaceutical Industry. While analyzing the aftermath of infringement and passing off of trademarks, special focus needs to be given to the effect of these concepts on the Pharmaceutical sector, and their ultimate hazardous effects on the consumer. Whereas infringement in other sectors might merely cause monetary losses, infringement in the pharma sector tends to cause serious and hazardous effects on the health of the consumers, sometimes even threatening their lives. A detailed analysis of the same is presented below. 1. In the Pharmaceutical industry, it is a general tendency to name the drugs either by its principal component, or by the name of the ailment for which it is used. But S.(13) of the Trademarks Act 1999, strictly prohibits the registration of ‘generic names’ and ‘chemical names’ as Trademarks. 2. To circumvent this restriction, the Pharma industry has adopted a novel approach of naming their drugs, by coining words which contain some part of the chemical name. Eg: Drug name: “Cipro XR” Generic name: “Ciprofloxacin”. 3. Though this approach has saved prosecution under section 13, but has in turn given rise to Trademark Infringement cases filed by companies, because of the obvious reason of a rival company, incorporating the same chemical in its drug, and thereby resulting in the adoption of a deceptively similar name. 4. The phonetic similarity in the names, the similarity in the packaging design and pattern of the box in which the drug is sold, the ailment and the class of the drugs are usually the factor which result in confusion among the public, and confusion with relation to drug, implies the purchase of wrong drug for the wrong ailment, thereby resulting in serious life threatening health hazards. 5. It is not to be forgotten that in a country like India, with rural population amounting to more than half the total population, and with a rich linguistic culture, even the slightest phonetic similarity in the names, especially where drugs are even available over the counter and verbal prescription of drugs is not new, the possibility of confusion is even more. The courts have also time and again reiterated the need to exert extra caution when adjudicating infringement cases pertaining to pharma brands. Following are few cases exhibiting the impartial stand taken by the judiciary in dealing with drug related infringement cases. Amritdhara Pharmacy v/s Satyadeo Gupta. – In the present case, the respondent had applied for registration of the trade name ‘Lakshmandhara’ in relation to the medicinal preparation prepared by him, claiming to be in use since 1923, which was opposed by the appellants who had proprietary interest in the trade name ‘Amritdhara’ in relation to a similar medicinal preparation, in use since 1903, on the ground that the former mark was deceptively similar to their mark, thereby resulting in confusion among the public. The Supreme Court allowed the appeal and held that the question of infringement must be approached from the viewpoint of a common man with average intelligence, and imperfect memory, for whom the overall structure and phonetic similarity in the names ‘Amritdhra’ and ‘Lakshmandhara’ is likely to deceive and cause confusion. It further held that the common man will not go for splitting the names and analyze their individual meaning before purchasing, but would rather depend upon his memory, or what he has learnt from someone about the product. Cadila Health care Ltd. v/s Cadila Pharmaceuticals Ltd. – The petitioner was engaged in the manufacture of the drug known as ‘Falcigo’ for the treatment of cerebral malaria, commonly referred to as ‘Falcipharum’ and applied and got registration for the said trade name ‘Falcigo’ in 1996. The respondent also were engaged in manufacturing a drug named ’Falcitab’, and got it registered in 1997, also for the treatment of ‘Falsipharum’ malaria. The Supreme Court held amongst others that lesser proof is required to prove infringement in pharmaceutical cases, especially medicinal cases. It further held that confusion in drugs and medicines could be life threatening, and hence drugs should be treated as poison and not as sweets, and also emphasized the need for stricter standard in matters of infringement involving pharmaceutical products. It further held that the petitioner was right in claiming for infringement, as the products involved were medicinal, which carried a greater risk of confusion as compared to non medicinal products, thereby exposing the buyers to fatal and disastrous effects. Ranbaxy Laboratories Ltd v/s Anand Prasad & 4 others. – The appellant was the registered proprietor of the mark ‘Fortwin’ and had been using the mark since 1975, relating to pharmaceutical preparation for treatment of some bone related disorder. The respondent applied for the registration of mark ‘Ostwin;, again for the same treatment of bones, which was opposed to by the appellants as being deceptively similar to their mark. In the above case, the IPAB held that, though prefix of both the marks are different, i.e “Fort’ (appellant) and ‘Ost’ (respondent), they do have a common suffix, i.e ‘Win’ It was further held that since the rival goods are also pharmaceutical goods, serious consequences might follow due to deception and confusion in the minds of the general public. Thus taking into consideration the public health and welfare, the appeal was allowed. Win Medicare Pvt. Ltd v/s Galpha Laboratories Ltd & others. – The plaintiff company was engaged in the manufacture of pharmaceutical preparations under the trademark ‘Betadine’. In may 2013, the plaintiff noticed an advertisement in the Trademarks journal for the registration of the mark ‘Bectodine – M’, and also came across the products of Defendant no. 1 indicating that the products were being manufactured, and hence approached the Delhi HC for injunction. The Court applied the principle of ‘likelihood of confusion’, and held that there was a risk of confusion. It further held that the defendants had knowingly adopted a deceptively similar mark as was evident from the identical colour, similar trade dress and packaging, and hence granted the injunction. It is a well accepted fact that ‘There are two sides to every coin’. Thus, if on one hand, there is a rise in the utility of intellectual properties like trademarks, on the other hand its misuse and infringement also rises, which though cannot be completely eradicated, but can be controlled to a major extent by judicious adherence to the legal and statutory principles established for that purpose. As mentioned above, infringement and passing off in the pharmaceutical sector cannot be taken lightly as the same has disastrous effect on the life of an individual. The Courts have also taken a similar stand which is pretty evident from the above discussion. The cases referred to above clearly depict the impartial view of the Judiciary, and its detailed analysis and the stringent approach adopted by it, especially when dealing with Pharma brands involving public health and welfare. Shaw Bros. v/s Golden Harvest (1972) RPC 559 at 563, 567. Singer v/s Loog (1881) 18 Ch D 395 at 412. The Court applied the principle of ‘likelihood of confusion’, and held that there was a risk of confusion. It further held that the defendants had knowingly adopted a deceptively similar mark as was evident from the identical colourpharmaceutical similar trade dress and packaging, and hence granted the injunction. 102 queries in 0.203 seconds.